BizTalk360 offers similar capabilities as the BizTalk server administration console that allows administrators to query the message box database for all running and suspended service instances. 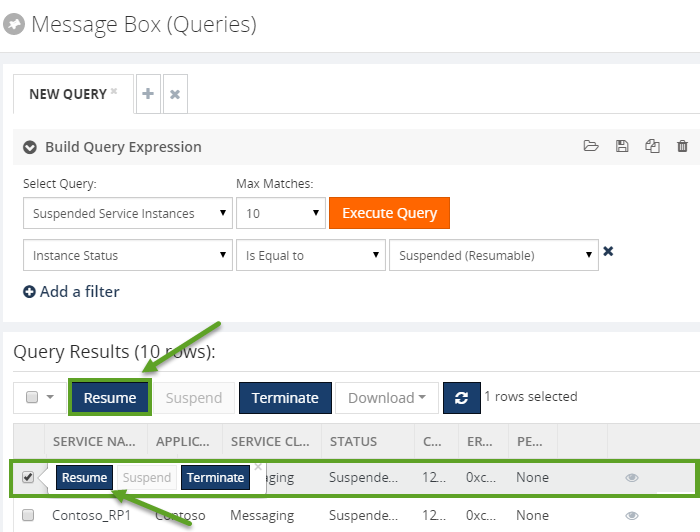 The major difference from the admin console is the web-based look and feel of the Message Box (Queries) section. In addition, BizTalk360 offers few extended capabilities such as Integrated knowledge base where users can attach knowledge base articles next to a suspended service instance. Add a filter - To filter the results based on different parameters. The parameters will vary while retrieving the status of In-progress service instances, running service instances, and suspended service instances. Once the filter criteria is selected, you will automatically see the values for the filter getting listed in the drop down. Ex. Host Name, Is Equal To, BizTalkServerApplication. When host name is selected from the drop down, the value BizTalkServerApplication & other host names will automatically be listed in the drop down. The user can select the required value. 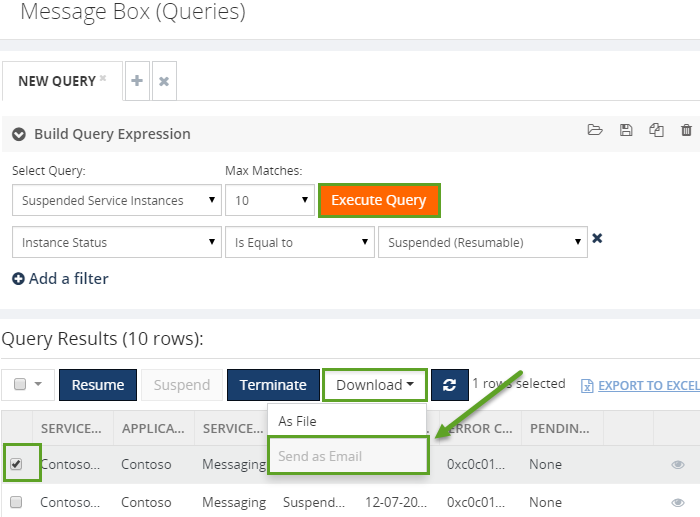 This example shows you build a query for all in-progress service instance with filter condition set for Orchestration service class. 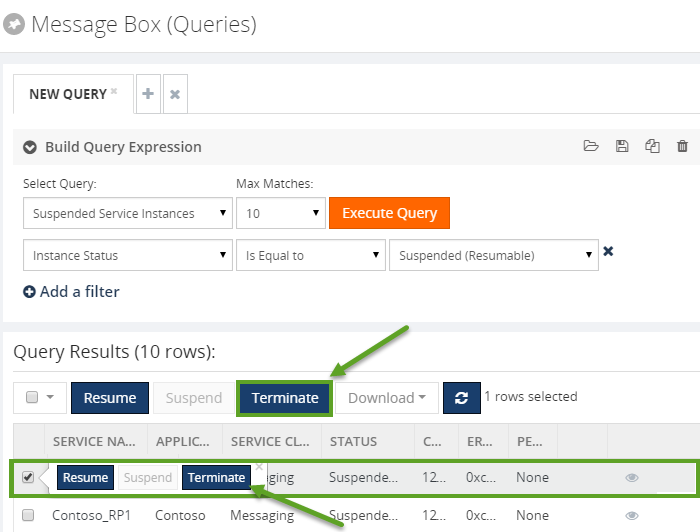 This example shows you how to build a query for all in-progress service instances and view the Service properties for one of the Service Instances from the query results. Add a filter - To filter the results based on different parameters such as creation time, error adapter, error code, error description, host name, instance status, message ID, message status, message type, service class, service instance ID, service name, service type ID, and URI. Once the filter criteria are selected, you will automatically see the values for the filter getting listed in the drop down. Ex. Host Name, Is Equal To, BizTalkServerApplication. When hostname is selected from the drop-down, the value BizTalkServerApplication & other host names will automatically be listed in the drop down. The user can select the required value. 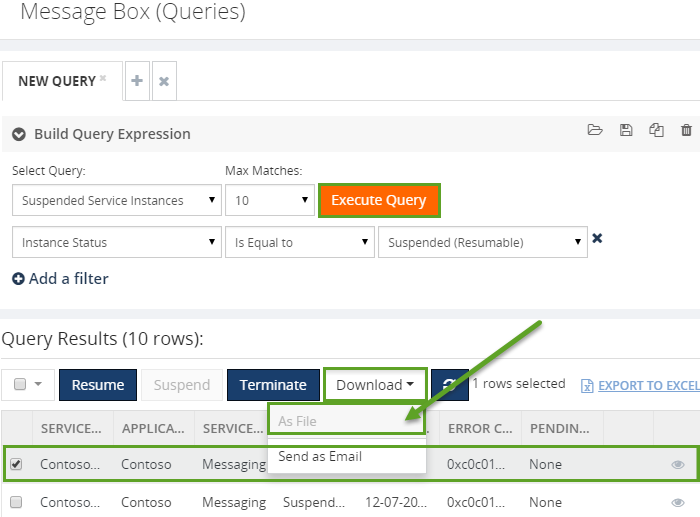 This example shows you build a query for Messages with filter condition set for Orchestration service class. Click the video, this example shows you build a query for Messages and view the Message properties and content. BizTalk360 offers the identical capabilities as the BizTalk server administration console with respect to querying the message box to list the suspended and running service instances. In addition, BizTalk360 offers an additional capability that allows users to download the message content and context (in zip format) and email to their team members to diagnose specific issues. The download and e-mail functionality is made available both at the Service Instance level and Message level. BizTalk360 allows the users to enter a maximum of 10 email addresses. The email addresses should be separated by a comma. The SMTP settings need to configured in BizTalk360 in order to be able to trigger email alerts. In addition to querying the service instances, users can perform operations such as Suspend, Resume, and Terminating the service instances depending on the requirement. For instance, when a service instance is in the Suspended (Resumable) state, the administrator can choose to Resume the service instance or Terminate the service instance. 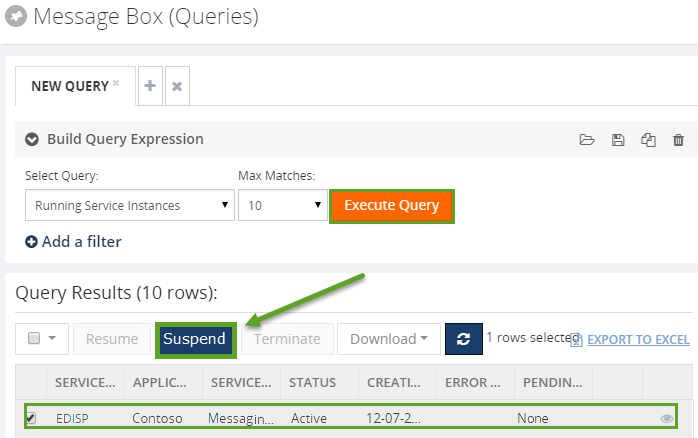 Follow the same procedure to suspend/resume/terminate a service instance and message. Resuming a Suspended Service Instance When a service instance gets suspended for some reason, it can either move into a resumable or a non-resumable state. When in the resumable state, the administrators have an option to manually start the service instance through the portal. 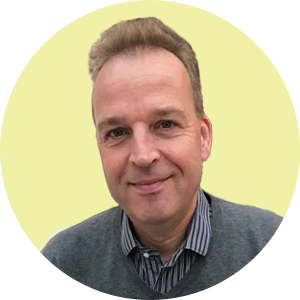 Similarly, the administrator can choose to terminate the service instances that are in the non-resumable state. Selecting the checkboxes against the service name(s) and clicking on the Operation buttons (Resume/Suspend/Terminate) at the top of the grid. Selecting check box against the service name. User will notice an inline operation showing up right next to the checkbox with the possible operations that can be performed on the service.